I’m in danger of becoming too dependent on the Viewranger maps, always available with a simple tap on the screen, showing where I am, where I’ve been, and – hopefully – some clue about where I should go next. While I always use map and compass as primary tools, the temptation to pull out the phone when I’m slightly uncertain of my position is difficult to fight. 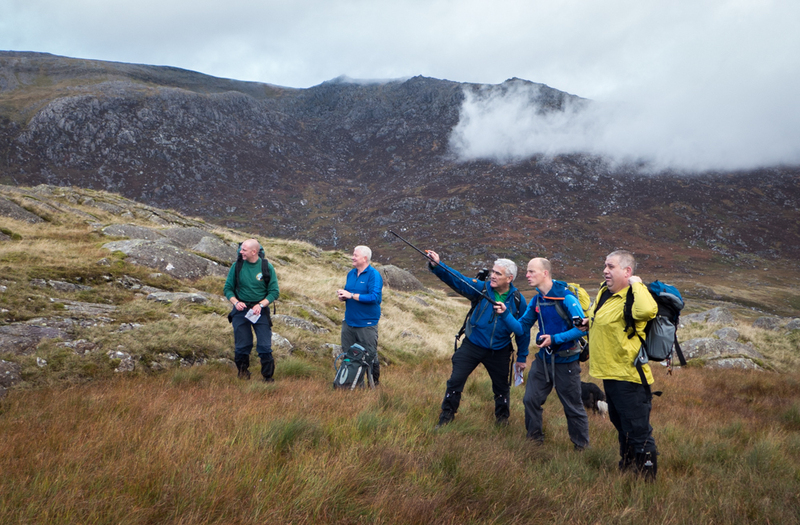 So when I saw that Rob at ExpeditionGuide was running a new one-day Advanced Navigation course, it seemed a good idea to use that to polish some of the rustier skills. Rob’s course uses contour-only maps based on the Harvey Superwalker series. These mark contours (at Harvey’s usual 15M spacing) and water features, grid lines, and nothing else. No roads. No paths. No walls, fences, sheepfolds or spouting whales. The intention is that the absence of these features from the map forces you to focus on slope and contour interpretation. The first challenge is orienting the map, as – with no writing – working out which way is ‘up’ is far from easy. After meeting at the Pinnacle, we parked close to the Pen Y Gyrwyd and followed the stream up to Llyn Cwmfynnon. As we walked, we tried to plot our position on the maps, using the sparse information on the map to help us. 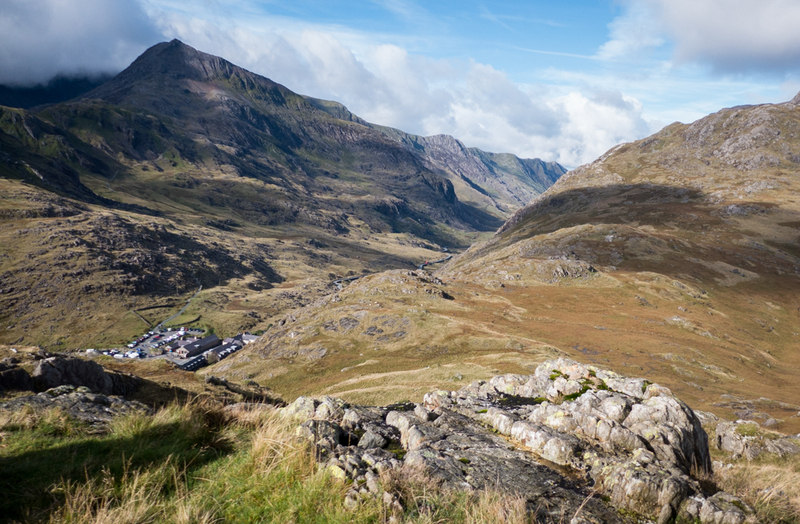 We worked our way up to Moel Berfedd, giving great views of Crib Goch and Y Lliwedd. The high ground and angled light made it a good viewpoint for identifying contour features below us. After a break we dropped down to Pen-y-Pass and heading onto the familiar -and busy- Miner’s track towards Snowdon, attempting to drawn the line of the path onto the map as accurately as possible. The short, steep climb off the path onto the Horns came as bit of a shock, as the rest of the day hadn’t involved any serious ascent. 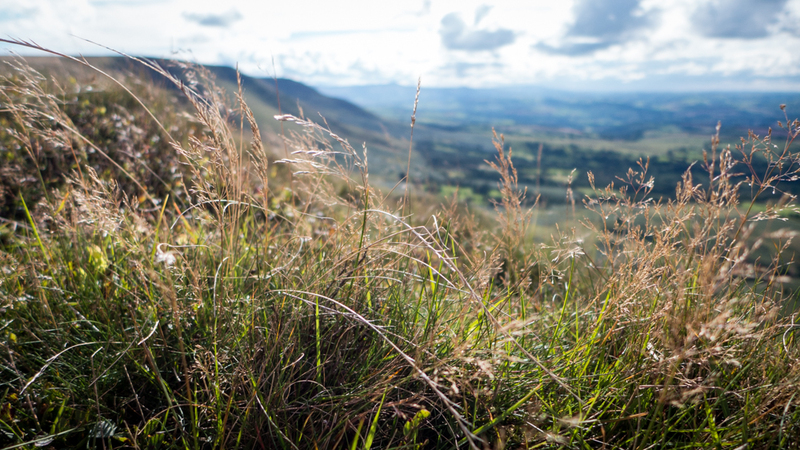 Breath caught – and ring contours identified – we carefully made our way down the steep grass to join the Pig track, before completing the day with a drink in the Pen-y-Pass cafe. The forecast for the day wasn’t great, and the reality was even worse: Hill fog, rain and some brisk winds, The weather should make this a “Quality Mountain Day” for Mountain Leader Training purposes , but most sane folk would dispute the use of that adjective. I left the start as late as I reasonably could as the forecast did imply things would get better later in the day, but eventually set off from Beddgelert around mid-day, aiming to take in Moel Hebog and the two outliers to the north: Moel yr Ogof and Moel Lefn. The return would be via tracks through Beddgelert Forest near the Welsh Highland Railway. 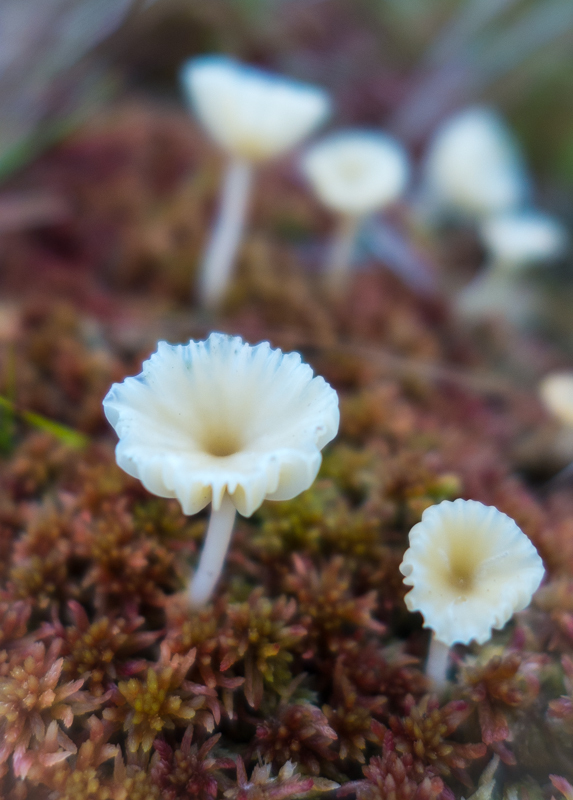 The camera stayed away almost the whole day, coming out briefly to try and capture some droplet-covered grasses and impressive pillow lavas on the short scrambly section of the ridge onto Moel Hebog. 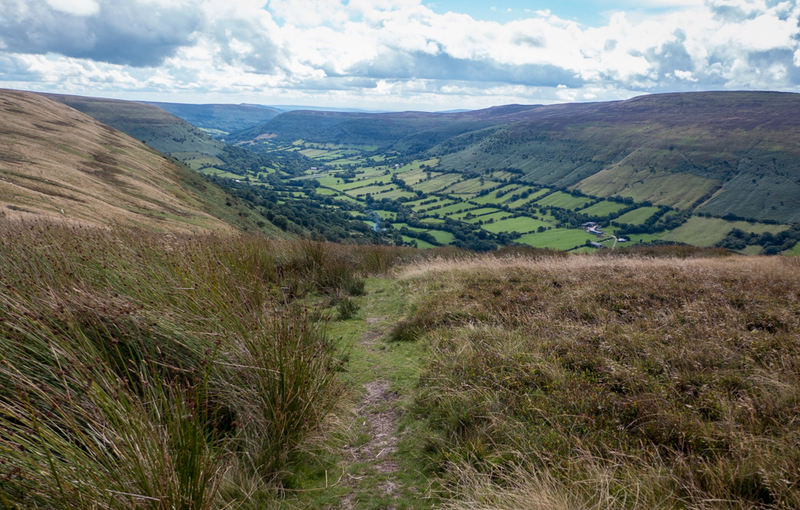 From the trig point, it’s a steep descent following a handy wall to Bwlch Meillionen, then upwards through an impressive rocky cleft onto Moel yr Ogof. 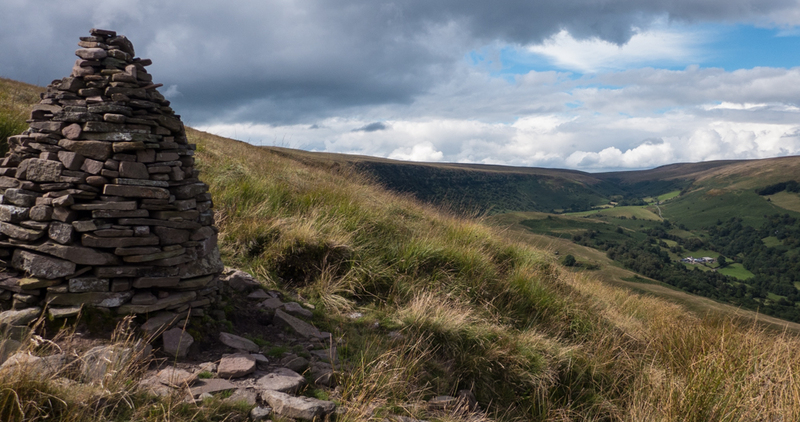 The climb to the top twists and turns a bit, and I arrived at the summit cairn somewhat disorientated. 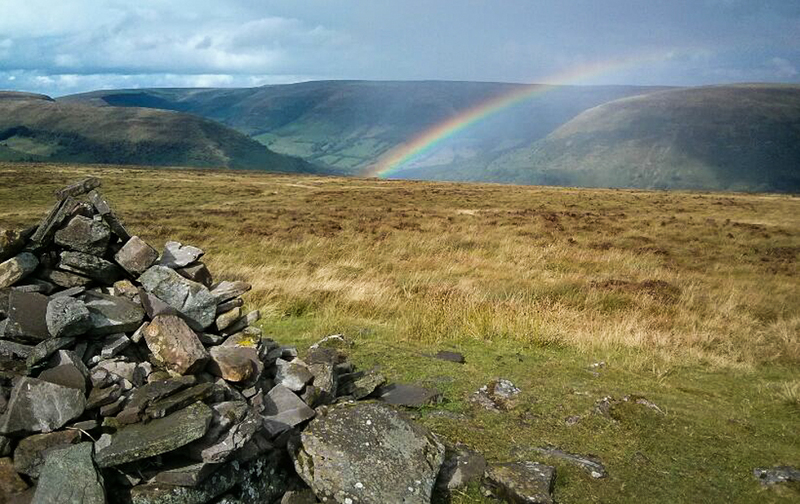 I triple-checked the bearing onward to Moel Lefn and picked up a path pretty easily. 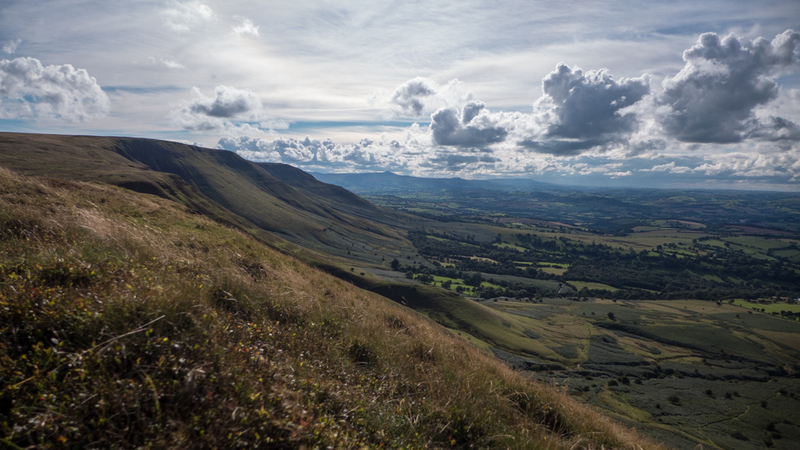 From Moel Lefn, the terrain gets more complex, and there are steep crags between you and the old quarry at the bwlch. The path I was on was heading in the right direction until it suddenly turned 90 degrees right: I eventually ignored the path, continued carefully down and was relieved to pick up a second lower path winding through the crags. 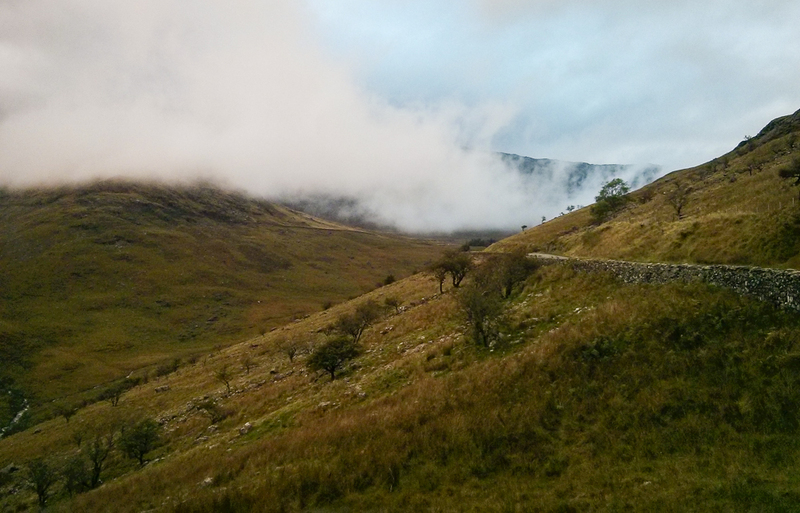 I was briefly below the cloud now, and there were some glimpses down into Cwm Pennant below. From the bwlch, there are some boggy paths through the forest that take you back onto the open hillside, then it’s down through a narrow (and wet) forest trail until you reach a wide and well signed track near Hafod Ruffydd Uchaf. 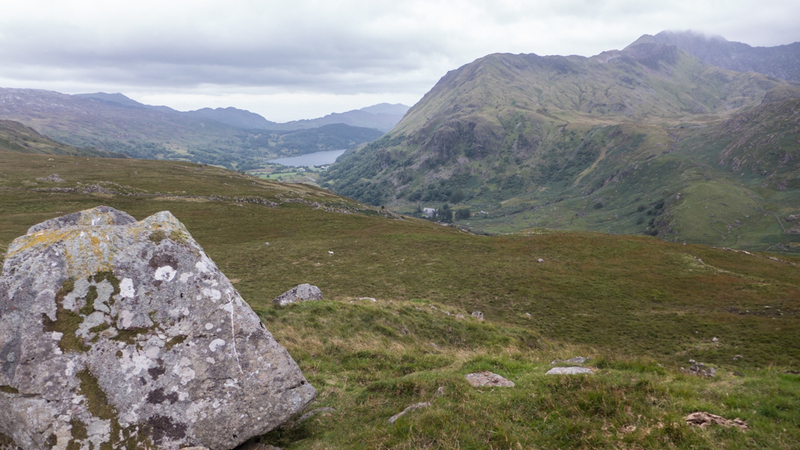 It’s best to ignore the map and follow the signed trail to Beddgelert now, as the path layout has been changed since the last OS map update. Heading back towards the car the tops were still covered in cloud, but it was lifting and breaking on the drive back to Betws, with Cwm Dyli and the Glyderau looking great in the late afternoon light. Sense of humour was restored once I was on my way, cutting across the river opposite the excellent Moel Siabod Cafe and following the path along the bank to Pont Cyfyng. I’d been up Siabod from this side a couple of times before, each time scrambling the Ddear Ddu ridge which drop you out by the trig point. Today, armed with a heavier pack I headed up the long northwestern ridge instead. 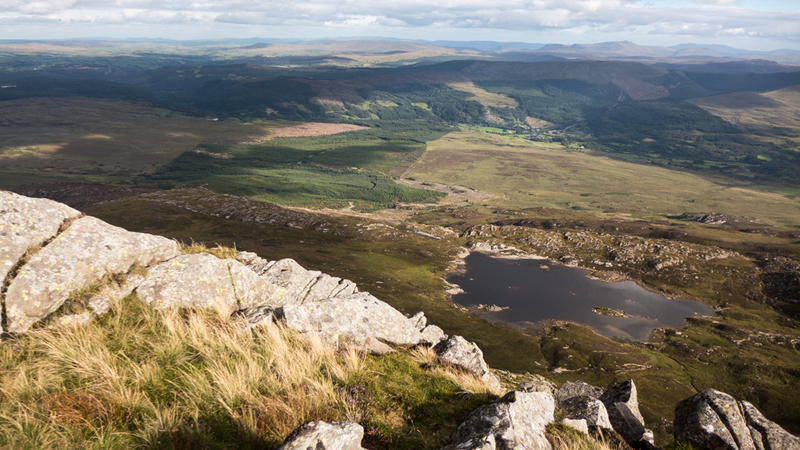 There’s plenty of easy scrambling and rock-hopping, and occasional views straight down the south face to Llyn y Foel. 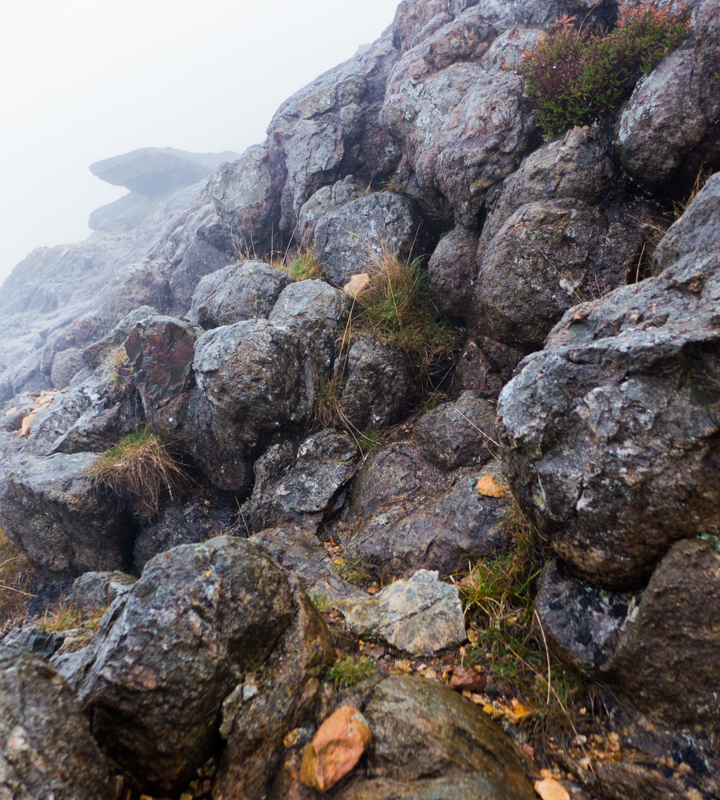 The rocky ridge continues a long way, before joining into the boulder fields that surround the summit. 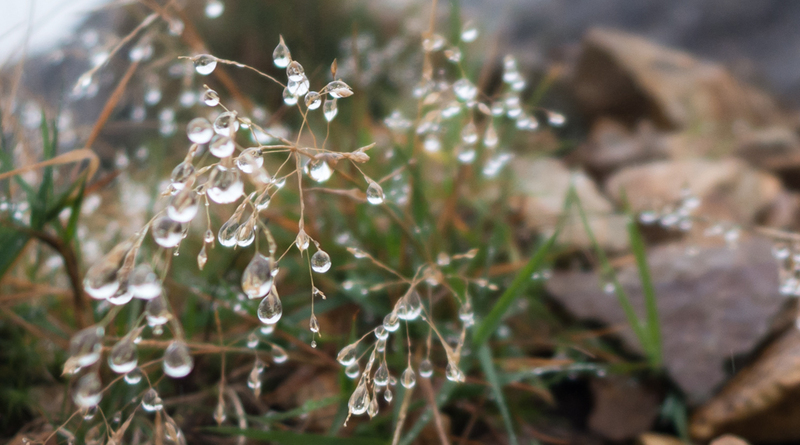 I ducked into the windshelter for a snack, and to consider my plan for the rest of the day. I was going to head down the west ridge, and look for a suitable camp spot, but hadn’t really planned where. 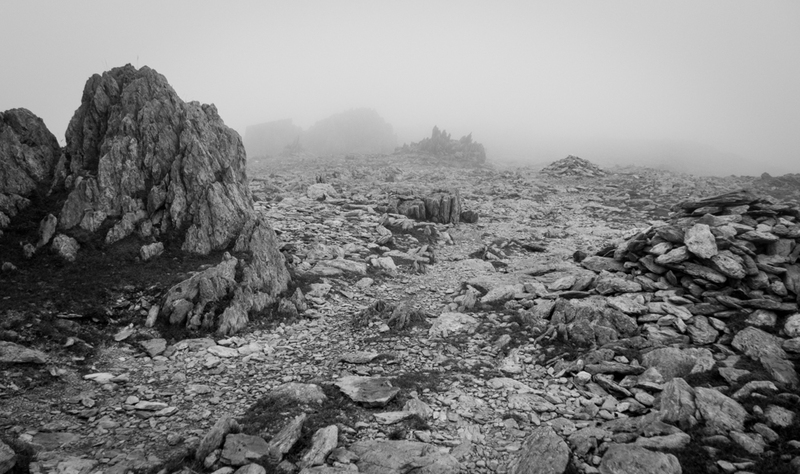 Llynau Diwaunedd had looked appealing on the map, but from the ridge it looked dark, cold and unwelcoming. Arriving a Bwlch y Maen I could see the glimmer of a small llyn, and while the water didn’t look suitable for drinking I still had plenty with me, and there was an inviting and well-sheltered pitch nearby on a knoll in the lee of the ridge. 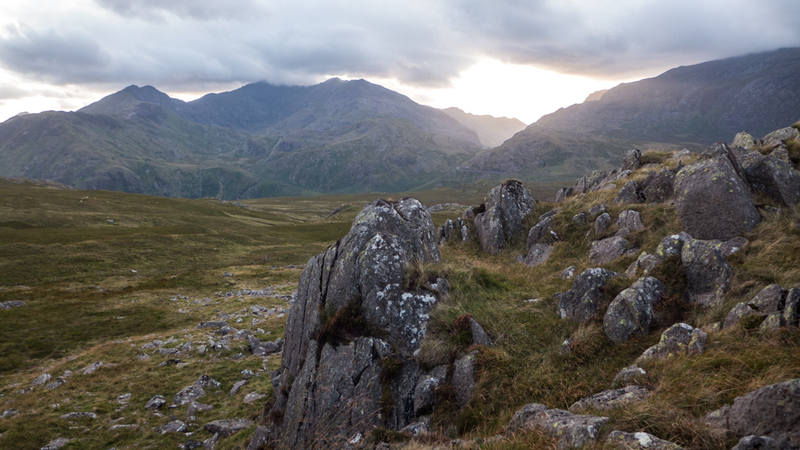 Couscous, coffee and flapjack consumed, I wandered around the ridge watching the sun go down in the Llanberis pass. The next morning I was up early and heading down towards the road near the Pen Y Gwyrd hotel. The flat plateau above the road showed the marks of grazing by cattle – grass grazed much higher than wooly lawnmowers would do, and the ground churned up in places with ankle-twisting postholes where cattle had walked. 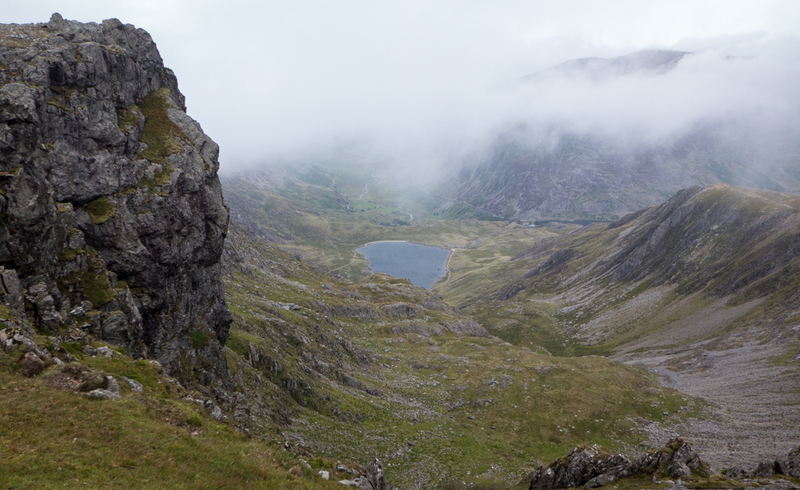 The forecast cloud was high, but still touching the peaks of Lliwedd and Snowdon. I planned to just pop into Pen y Pass to check the weather forecast for the day. Ducking through the full car park and streams of three-peakers, I found the cafe was open, and I miraculously had enough loose change in my pockets for an excellent breakfast and an espresso. 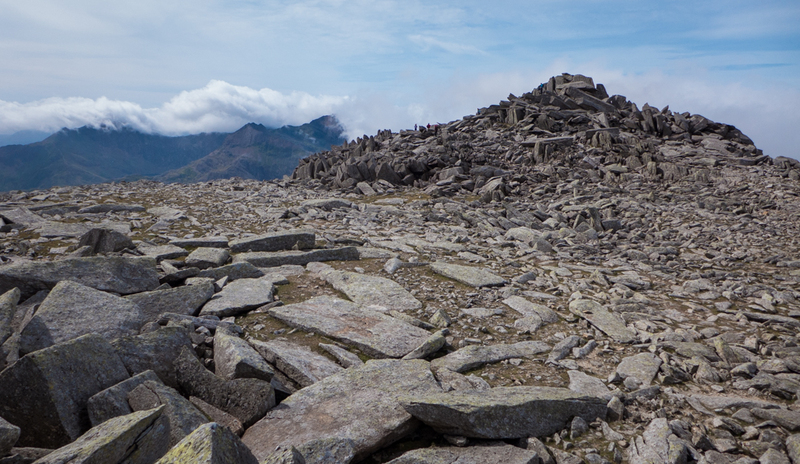 Fortified, I set out on the climb up towards Glyder Fawr, leaving the crowds on the other side of the road. 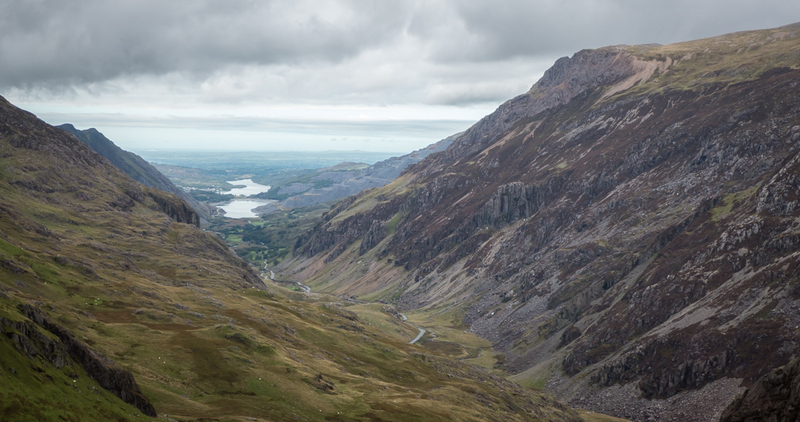 The route isn’t marked on maps, but I’d read about it in Peter Hermon’s Hillwalking In Wales. 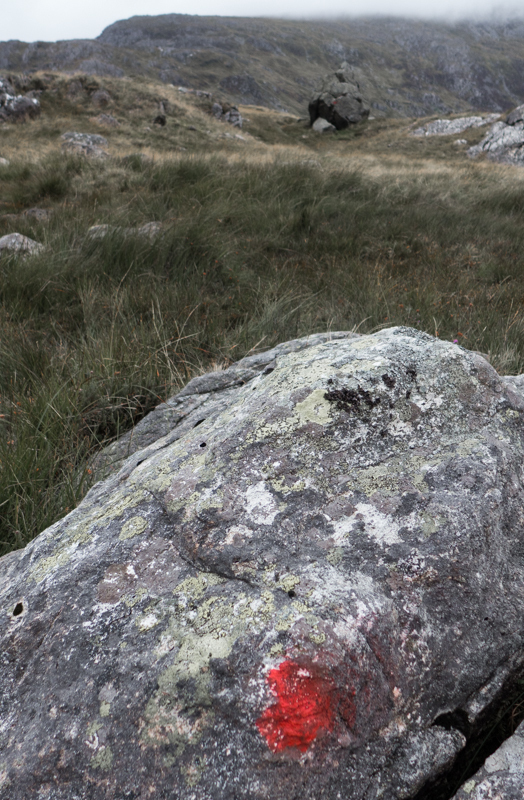 Red dots daubed on rocks mark the route, which – apart from a few short loose sections, is mostly on grass from Pen y Pass to the summit of Gylder Fawr. 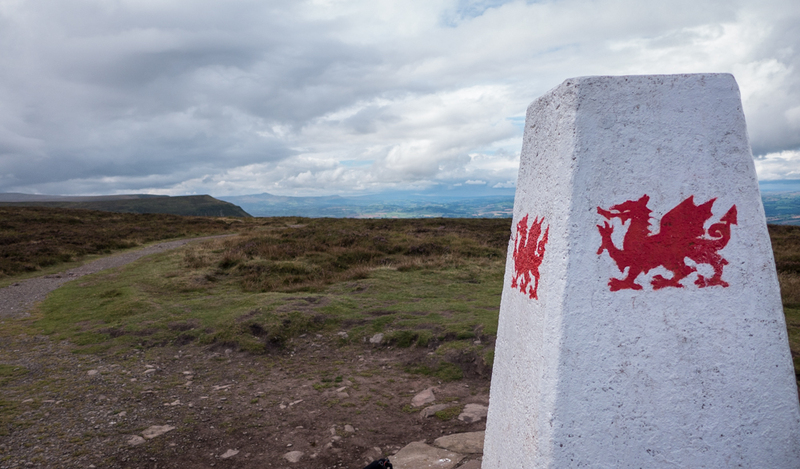 I’d asked one of the wardens (Helen Pye) if the route was still marked in this way, and she seemed to think not, so I was surprised when a red dot on a rock about 100m up from Pen Y Pass loomed into view. The dots are mostly small and usually faint, and in most places you won’t see the mark ahead until you’ve left the previous one behind. Useful in good visibility, and very comforting in mist as long as you stay on track. 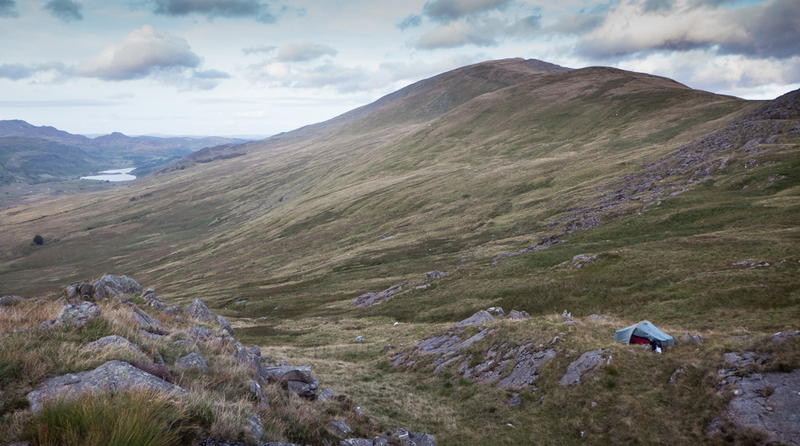 Between Pen Y Pass and Glyder Fawr, I saw just one person – a fell-runner descending at speed to the east of me. 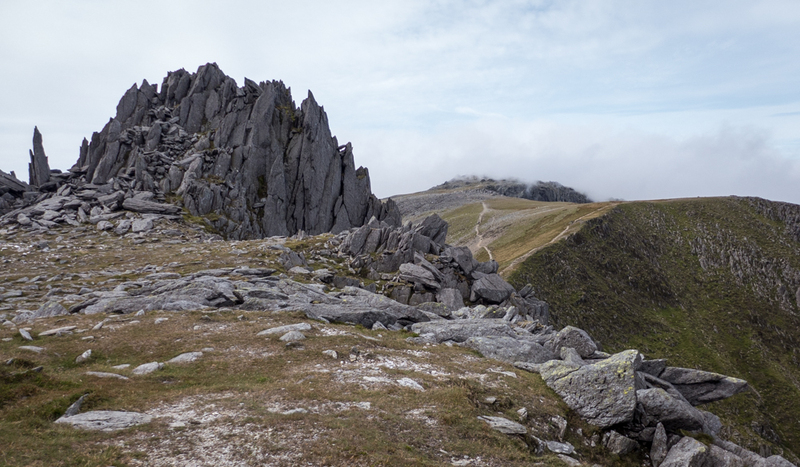 Cloud was covering the Glyder Fawr summit tors when I reached them, and after a snack break and a chat with a couple who’d come via the Devils Kitchen, I set off for Glyder Fach. With the cloud, this was like a moonscape, but as soon as I ‘d lost a small amount of height I was below it, with stunning views to Cwm Cneifion, Tryfan, and the Gribin ridge. 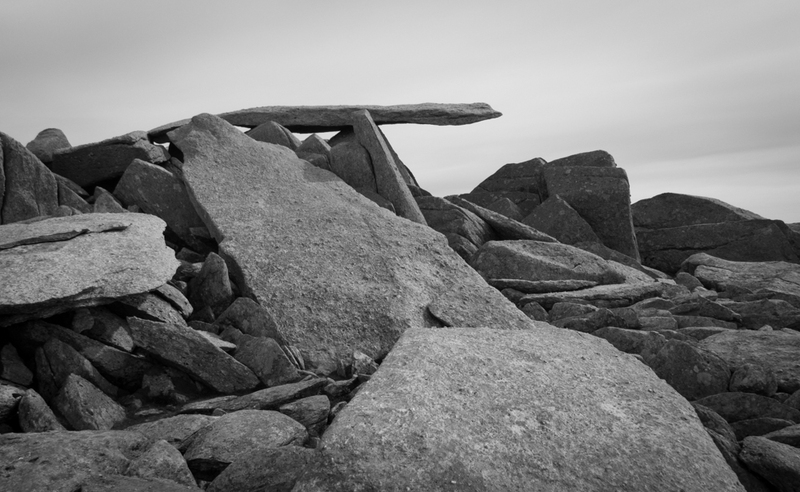 I headed past the summit of Glyder Fach to the Cantilever stone, for once without anybody posing on it. 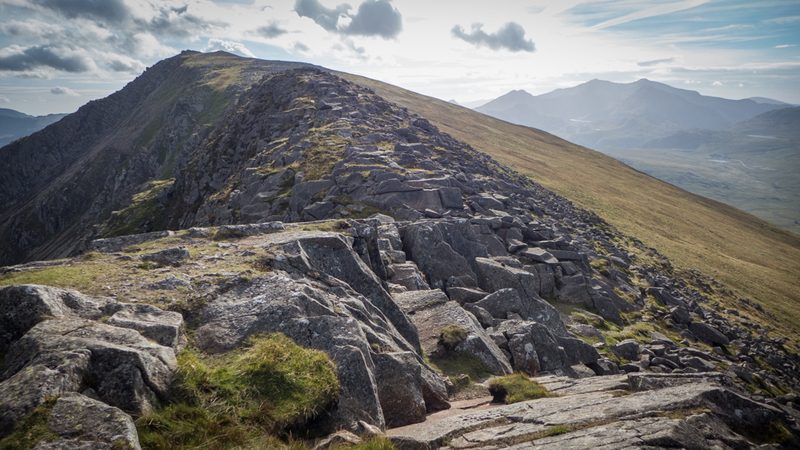 From here, my route was an easy, sunny walk down the long spine of the Glyderau back to Capel Curig, via the two tops of Y Foel Goch and Gallt yr Ogof.